Today was Day #4 of Chocolate and Peanuts Theme Week. Well, it's time to try a bar with something different. 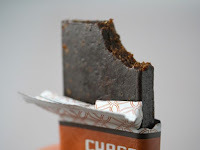 Today's energy bar contained brown cricket protein powder. Fear not. 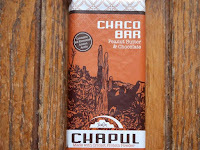 There was no identifiable cricket flavor or texture in this Peanut Butter and Chocolate Chaco Bar from Chapul (Salt Lake City, UT). What I could taste was the first two ingredients: slightly fruity, chewy, moist dates, and honey. The bar contained a blend of dates, organic raw honey, chocolate, peanuts, oats, cricket flour and flax seeds. Many living things rely on insects for valuable protein and a complete set of amino acids. Humans too—and not just the ancient Greeks and Romans, who also ate bugs. There are insect markets in Cambodia and in other Asian countries. Fried grasshoppers (chapulines) are on the menu in Mexico. And American Indians included roasted cricket flour in their diet. 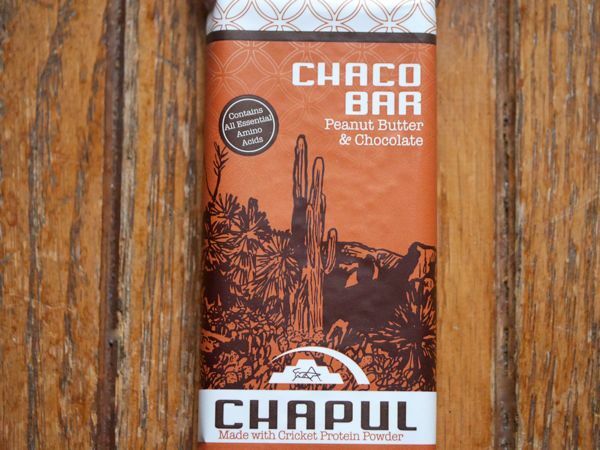 The name for this particular "Chaco" bar was inspired by the Chaco people, a "pre-Colombian civilization in the Colorado River Watershed."